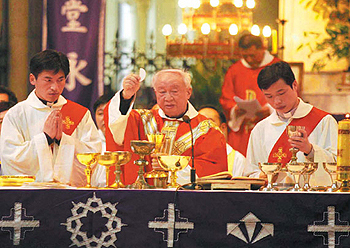 A Catholic mass is held in Shanghai, China. The government of Hong Kong is attempting to prevent a Way of the Cross procession scheduled for Saturday. Led by Cardinal Joseph Zen, former archbishop of Hong Kong, the event is set to call for religious freedom in China. It appears that the government of the semiautonomous region is fearful of offending Beijing on the matter, with the event set to take place a week after Chinese fury was stoked by the awarding of the Nobel Peace Prize to jailed Chinese dissident Liu Xiaobao. The government of the People's Republic of China considers Liu a criminal. China's growing economic and political weight is well documented. Earlier this year, the country overtook Japan to become the world's second-biggest economy after the United States. Official Chinese attitudes toward freedom of expression and religion will likely become more internationally significant as the country's global influence rises. For Catholics, three years after Pope Benedict XVI's "Letter to Catholics in China," an accommodation of sorts seems to have been reached between the Holy See and China. But the difficulties faced by Catholics in the Middle Kingdom persist, with two "underground" (Vatican-appointed) bishops still in jail. In July, both sides came to terms over the appointment of Antonio Xu Jiwei as bishop of Taizhou, who was ordained in a ceremony presided over by four other bishops who are in communion with Rome and recognized by China's state-backed church body—one of six similar ordinations to take place since April. However, that was merely the thaw after the deep freeze of Beijing's arrest of Bishop Julius Jia Zhiguo of Zhengding on March 30, the same day as a meeting of the Vatican's newly formed China Commission began. The body was set up by Pope Benedict in 2007, after his landmark letter, to "study questions of greatest importance" to Catholics in China, and was meeting for only the second time. In an April 2 press release at the conclusion of the two-day meeting, the Holy See said the arrest was not an isolated case, as other clergy have been "deprived of their freedom" or "subjected to undue pressures and limitations on their pastoral activities." Ordinary Catholics and other Christians in China do not suffer the same levels of day-to-day oppression as in the past, according to Marie-Eve Reny, who has conducted field research with underground Christians in China. However, "many underground Catholic priests are still subject to harassment, interrogations and detentions" if they refuse to submit to state-run church bodies such as the Catholic Patriotic Association, she said. A fundamental disagreement over the relationship between Catholic clergy and the state persists between the Holy See and the Chinese Politburo. According to Reny, who is based at the University of Toronto, "While in the eyes of the central government, reconciliation implies integrating the politically loyal underground clergy into the state-controlled one, the underground Church believes that the road to reconciliation is one of separation between the Catholic Church and the Chinese state." Interpretations of culture and history sometimes shed light on such diverging views. China acknowledges missionary Jesuit Father Matteo Ricci, alongside Marco Polo, as one of the most influential and honored Westerners to engage with China prior to the humiliations it suffered at the hands of colonial powers in the 19th century. The fourth centenary of his death was marked this year by many events and celebrations highlighting his role as a cultural interlocutor. However, as Pope Benedict pointed out in a May statement, Father Ricci "went to China not to bring science and Western culture, but to bring the Gospel, to make God known." In 1965, 14 years after China forced Catholics to sever ties with the Vatican, the Second Vatican Council outlined religious freedoms as requiring "that all men are to be immune from coercion on the part of individuals or of social groups and of any human power, in such wise that no one is to be forced to act in a manner contrary to his own beliefs, whether privately or publicly, whether alone or in association with others, within due limits." China, however, has long maintained restrictions on freedom of religion, and according to the 2010 Annual Report from the United States Commission on International Religious Freedom, "The Chinese government strictly controls all religious practice and represses religious activity outside state-approved organizations." For the Chinese government, the need to maintain social stability often means curbing dissent or at least managing it in ways that limit social tensions or animosity toward the state. The rapprochement that has resulted in agreement on the appointment of six bishops could, perhaps, be seen in this light. Father Bernardo Cervellera, a priest of the Pontifical Institute for Foreign Missions, who has directed the agency AsiaNews since 2003 and has taught at Beijing University, said Beijing's accommodating stance is likely due to realizing that "the Chinese faithful is increasingly less likely to accept bishops who do not have Vatican approval." More clues to the latest developments in official Chinese thinking can be found in President Hu Jintao's speech to the Politburo on October 1, China's National Day, in which he asked that "society's harmonious factors [be boosted] to the maximum degree." Many China watchers regarded the comments as reminiscent of Maoist tactics aimed at keeping a lid on "contradictions among the people," to use the terminology applied by Mao himself. Official fears about dissent might also explain why the long-awaited gathering of the Catholic Patriotic Association has been delayed repeatedly over recent months. According to Jesuit Father Michel Marcil, director of the U.S. Catholic China Bureau at Seton Hall University, "The longer it takes [for] the CPA congress to meet, the more it shows the lack of consensus inside the CPA" and, he speculates "the strength of the bishops in communion with the Pope." Whether or not the much-postponed CPA summit meeting takes place will be a litmus test for the Chinese government's attitude toward the Catholic Church going forward, according to Father Cervellera, editor of AsiaNews." If the meeting takes place, it will signal that the government wants to retain control over the Catholic Church in China. If not, then maybe it will mean that the government seeks a dialogue." This article was originally published by the National Catholic Register: www.ncregister.com/.